THE 1907 BANK PANIC: WHAT IS "MONEY"? Before Fred J. Wiseman discovered he had wings, his hands seemed permanently gripped to a steering wheel. Also, he apparently didn't understand the concept of brakes. We first met Wiseman in 1905, when a Santa Rosa policeman caught him speeding down Fourth street (but Fred got revenge a few days later, forcing the same cop to arrest himself for spitting on the sidewalk). Later that year he appeared as a driver-for-hire, giving James Wyatt Oates and his Civil War-hero brother a drive around Sonoma county (on the final stretch, he opened up the throttle "in a manner which shook the party up"). In 1905 he also opened Santa Rosa's first gas station/garage, and seemed destined to stay here forever. But the garage was destroyed in the 1906 earthquake, and some time in the months that followed, Wiseman moved to San Francisco, where he began working for the J. W. Leavitt auto dealership. We next heard about him in the late summer of 1907, when he was taking a young woman on a spin through Golden Gate park one Sunday afternoon and the car tipped over (not his fault), pinning her beneath. She escaped without serious injury, and they married about a year later. 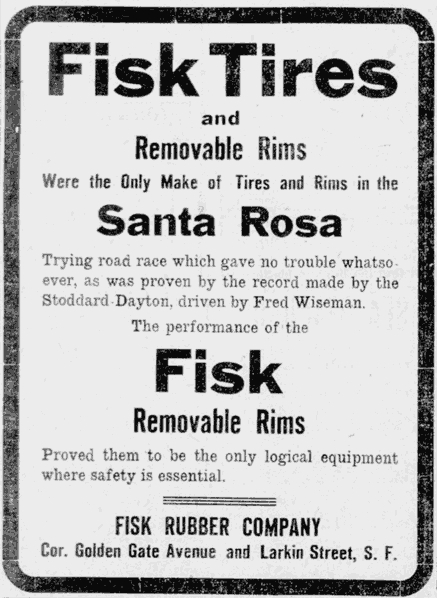 By the summer of 1908, Wiseman was racing Stoddard-Dayton automobiles sold by his boss. In a vehicle that looks today like a lawn tractor on steroids, he buzzed around a racetrack in Concord at almost sixty (60!) miles per hour; as the Press Democrat noted, "he is foolish to go fast for if something should go wrong it might mean a sacrifice of his life." A few weeks later, he competed for the "Santa Rosa Cup" in his hometown and won. (This was not the first auto race in Sonoma county, however.) And a few weeks after that, he won big at the Tanforan racetrack near San Francisco. All of these were primarily thoroughbred horse tracks, of course, unpaved and unbanked. The first auto racetrack was built the following year in Indianapolis, where a Stoddard-Dayton won the premiere race. 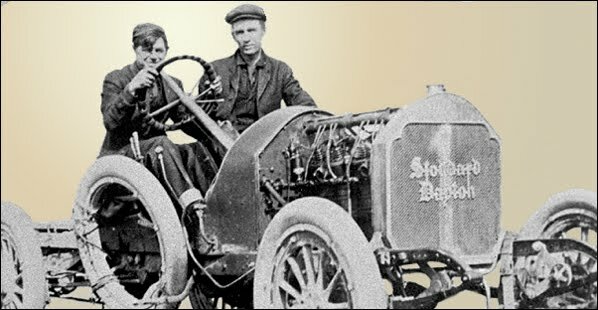 Wiseman was now an exhibition driver and "head automobile man for the company," showing off the Stoddard-Dayton throughout Northern California and Nevada. His first race competition in the new year of 1909 came from an open challenge by another dealership for a hill-climbing race on the terrifying peak of 19th avenue in San Francisco. Unfortunately, the newspapers of that day did not specify exactly what they meant by "Nineteenth avenue hill" where the race was held, but for readers outside of the Bay Area, 19th ave is a major north-south traffic artery for the city with fairly gentle hills (think of a roller coaster sanded down by millennia of erosion). Like most races of that day, there were starting trials according to the selling price of the automobiles, and Wiseman and the Stoddard-Dayton easily won the race for cars costing $1,200-1,800. In the climactic free-for-all race, however, Wiseman came in fourth - the winner of that March 28th competition was a Stanley Steamer. A few weeks later, Fred was again in Santa Rosa to drive in the first California Grand Prize Race. This was no small affair; thousands came out that May 9 to cheer the dozen drivers as they started the cross-country race to Geyserville and back, some 50 miles. The route was grueling; only half of the cars crawled across the finish line a little over an hour later, one of them driving on a rim because his left front tire blew out somewhere near Windsor. It's a pip of a tale, but it's not a Fred Wiseman story - he came in third. Honors that day, as well as the breathtaking $500 prize, went instead to Ben Noonan, Wiseman's old friend and business partner. Wiseman's losing streak didn't last long. On May 16 he set a new speed record for driving from Oakland to San Francisco (via San Jose). As he was going through Santa Clara, his car ran over a fallen telegraph pole that "gave the car such a bounce that it tore the seats off the body," according to the SF Call. The accident also ruptured a fuel line, and Wiseman had to frequently stop and manually prime the carburetor with gasoline. After it was over, they found he had only about a quart of gas left in the tank. Attempting to beat his own record over the same course a week later, Fred had a far more serious accident. Wiseman lost control of the car when it encountered a remarkably bumpy stretch of North First street in San Jose. The racer went off the road and hit a tree, throwing Wiseman and his mechanic passenger ("J. M. Peters," probably the same as J. W. Peters) about 40 feet. Both men were taken to a hospital, but not seriously hurt - although a wire service story claimed both were "probably fatally injured." The Stoddard-Dayton was demolished by the accident. Fred apparently did lots of racing in 1908-1909 that wasn't reported in the papers (or at least, can't be found in the newspapers that have been digitally indexed). There were grumblings by the American Automobile Association (AAA) that he had "driven in practically every contest of any importance held in California," including events not authorized by local AAA chapters. The Association, which was trying to cut down on street racing and legitimize auto track racing as a organized sport, had national clout; they could have blocked Wiseman from participating in an important track race in Indiana on June 18. Fred drove in that competition, but came in 16th place didn't place - after the first three cars passed the finish line, drivers were flagged off the course, turning all other positions into endless saloon debates. As he was in the Midwest and not far from the Stoddard-Dayton company (also probably his sponsor in the Indiana race), the story goes that he visited their auto plant in Dayton, Ohio - a town that also happened to be the place where a couple of brothers named Wright were building airplanes. Whether he stopped by and met Orville (Wilbur was then in France, preparing for his historic flights later that summer) them is unknown; but that race in Indiana is the last record I can find of Fred J. Wiseman ever being in an auto race. Likely he spent the long train ride back to California dreaming of what the sky may hold. A San Francisco paper publishes a picture of Fred J. Wiseman, formerly of this city, driving a Stoddard-Dayton automobile on the Concord track. The picture was taken while Wiseman was driving the car at the rate of twenty-five miles in twenty-eight minutes on a mile track. Wiseman is one of the most daring and clever riders and in his track racing has demonstrated a thorough control of the machinery. His friends, however, agree that he is foolish to go fast for if something should go wrong it might mean a sacrifice of his life. Two fine trophies are being displayed in the window of the Santa Rosa Cyclery, which are attracting considerable attention, especially among the automobile enthusiasts of this vicinity. They are the silver cups won by Fred Wiseman in the great races at Concord a short time ago, and are among the finest loving cups ever brought to this city. One of the cups was the reward for driving the 25 mile auto race in 28 minutes, and the smaller for winning the ten mile race in 11¼ minutes. The trophies are suitably engraved. Wiseman drove a Stoddard-Dayton machine in the races in which he won the trophies, and it is stated that he will be here with one of his fast machines for the races Saturday and Sunday of this week. The machine will be entered both days. The many friends of Fred J. Wiseman, son of Mr. and Mrs. A. W. Wiseman, of Melitta, will be interested to know that he is a benedick [married man], and has been one since July 2, when he and Miss Alice Ferguson, a charming and beautiful San Francisco girl, were quietly married in San Rafael. On the occasion of his visit here last Saturday and Sunday to attend the automobile races just one or two most intimate friends were let into the secret. They lost no time in extending feliciations as many others do now that the announcement of the marriage is made. The bride is a niece of Mr. and Mrs. W. E. Ferguson of San Francisco, who were present at the wedding. Mr. Ferguson is senior member of the Ferguson-Breuner Company, and is a wealthy and prominent man. For some time she had made her home with the Fergusons. Mrs. John Bruener, who was formerly Miss California Cluff, gave a reception recently in honor of the bride. 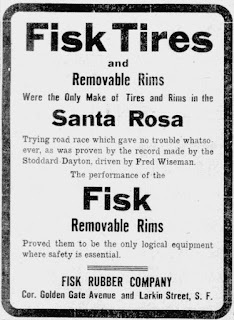 Fred J. Wiseman, "the Santa Rosa Boy", as he is familiarly called when he drives in the great automobile races, certainly made good with his Stoddard-Dayton in the great auto races held on Sunday at Tanforan. Ten thousand people watched him win the three great events of the day, even beating the little lightning Comet, which won so many of the events here. The little Comet won the Novelty race in fast time. When Wiseman drove here at the time of the auto races he predicted that he would annex more of the trophies when he participated in the Tanforan. He did so. The members of the Sonoma County Automobile Association are reminded that they are invited to the good roads meeting and good roads ball to be held in Glen Ellen on Saturday night of this week. A number of them are planning to go to show that they are heartily in sympathy with the movement for good roads. By the by, "Good Roads" is the slogan of the Sonoma County Automobile Association. A particular feature of Wiseman's triumphs in the races of Tanforan, was his beating Bert Dingley, who drove the specially constructed racing car, Chalmers-Detroit "Bluebird." He was given a big ovation. The many friends of Fred J. Wiseman, the expert auto driver for the J. W. Leavitt Company of San Francisco, will be glad to learn that the Stoddard-Dayton Company has asked him to come east next year and drive in the annual endurance Glidden run of 2,000 miles, The offer is a very flattering one and of course will be accepted by Mr. Wiseman. Wiseman with his Stoddard-Dayton has won all free for all races in the state this season. In addition to participating in the endurance run in the east next year, he will also join in other important racing events. Mr. and Mrs. Wiseman have been spending a few days with Mr. Wiseman's folk at Melitta. They have now driven to Lake country for a few days on a vacation outing. They are using the racing car with the exception of course, that the "muffler" is on. Upon their return to San Francisco they will go to Los Angeles.